The best thing about the fall is the beauty of the leaves changing colour. It's like nature is going out with a bang before the winter. Herbert loves to admire the New Hampshire scenery on his way to Massachusetts. There are many ways to get to Massachusetts from The Flower Pot, but according to Herbert, there's only one way to get the best views. When you leave Montreal, you must take highway 10 to Magog and highway 55 to the border. From there you travel on the 91 until you get to St. Johnsbury, Vermont, where you switch to the 93. The 93 takes you over a notch, right through White Mountain National Forest. Keep your eyes open, and your camera ready to capture the stunning foliage. Click here for more specific directions to White Mountain National Forest from Google. 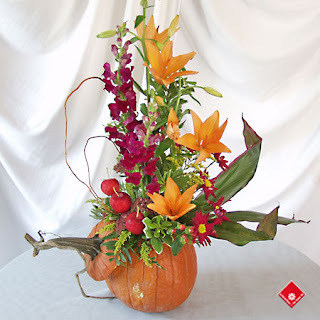 Here at The Flower Pot, we really appreciate every season because they each bring something unique to our arrangements and to our store. This gorgeous pumpkin arrangement was inspired by fall and brings almost all the colours of autumn leaves into your home. If you can't easily go out and about to enjoy the fall colours, The Flower Pot has found this lovely video on YouTube featuring gorgeous images of colourful leaves set to the sounds of Nat King Cole performing "Autumn Leaves".